Born in Moers, Germany, in 1964. The big scenographies, urban landscapes and nature, that are not necessarily connected with the human world are the main themes of the artwork of Thomas Ravens. His philosophical studies and research, are inspired by the Situationism Philosophy of the beginning of the 70´. His ambiguous compositions are inspired by the Bauhaus, the design of Renaissance Cities of the XVI century, or the ideal of Babilonia. His compositions can also make us feel the darkness of any expressionist film by Fritz Lang or the human disaffection of Blade Runner. His scenes are usually marked by scenes of huge walls of concrete next to a crowd. In the past years, the Berlin based artist Thomas Ravens has focused his drawings almost exclusively on landscapes and spaces, within which he combines fictitious configurations with found materials. The watercolors prompt associations to a metropolis a vision of the future that seems eerie and uncanny. There are stadiums filled with masses of humans who take a seat, seemingly undisturbed, next to an abyss; enormous halls in which seated groups of people in vitrine-like creations and plants are superimposed with tribunes. It could be the scene of an exhibition or a fair, a massive event; that actual purpose seems indefinable. The scene is usually depicted from a central perspective – upon closer examination there are various breaks into other spaces and perspectives. What appears to be science fiction comes from a precise observation of the present. In his paintings, Thomas Ravens fabricates much less than one initially assumes – he uses an image archive, newspaper clippings and books as his basis. They are images of modern architecture, such as Eero Saarien’s TWA airport terminal images of clean-up after flood catastrophes, sporting events, battlefields, memorial services on New York’s “Ground Zero”. These real events combined with staggered fabrications result in the landscape that Ravens wishes to display – it is a political landscape filled with rituals of the masses. Thomas Ravens writes in a statement on his images: “Landscape is interpreted as an over-built convex, usually in which many are observing many, and many are observing, and many observe: the football stadium is probably the most contemporary of all landscapes”. One can imagine the simple construction. In the foreground one sees a rectangular room, unfolded Hover which a second and sometimes a third levels away, the perspective tapering into right border of the image. This is how architects have always sketched the ambiance of the streets bordering the buildings they designed. This is how public spaces have been graphically documented since the Renaissance. However the swaying groups of people and the integration of abstract household objects, is not completely along those lines – but neither was Futurism or Giorgio de Chirico’s paintings on metaphysics. The ink drawings, watercolors and oil paintings leave no doubts. Thomas Ravens is a sophisticated artist who draws from pretty much sources. This makes his work a quiz show for prospective art historians. Tomas Ravens`s miniature figures are chilling in a flying party UFO, cruising over a green polka dot and striped hill landscape. Yet this is only one of many options for freedom. 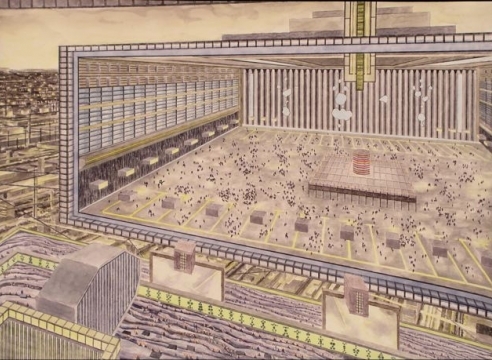 Two drawings later, a violent mass of people gather in an arena, surrounded by a dirty Project housing and iron grey catwalks. The masses stream toward a cinemascope format, white rectangle. An open-air cinema or a demonstration? One doesn´t know. Because Ravens slickly focuses the perspective of his images into a fictitious place and a non definable society that seems to be waiting for something to happen. At the same time, the stillness of the paper seems to suit him the spectacle itself has become a monument regardless if it is as a rock concert, a film premier, a sightseeing tour or an event. However, the drawings are not merely illustrations supporting texts from the good old days of Situationism. While studying philosophy and linguistic at Bielefeld, Ravens, most likely read Guy Debord writings on cultural industry. However, what followed was his education at HdK, where practical art lessons lead to questions of position: should I participate in the system or resist it? Ravens decision is not obvious. He may maintain a fascination with the characteristics of the world of adventure at a distance by deconstructing them to the size of model airplanes and placing them in rows like a comic book sequence. But the detail-obsessed perspective also contains belittlement, if not fetishism. The abundance in artifice sometimes causes one’s interest in the actual object to disappear – the nuances in ceiling tiles in countless shades of brown becomes more important than the room below, filled with people perhaps precisely because nothing is happening down there. On the other hand, Ravens objective in his settings is not to reflect real life experience. The buildings are invented, assembled with pieces from various sources and serving, finally, as a rare show. Ravens began in 1995 with drawings of the national pavilions at the Venice Biennale. One sees a person, coming out of a building, towards the viewer. While only an abstract wall remains of the architecture form the background, one recognizes its national classification by the sign: was that Spain, now comes Denmark? Again, this aimless order reflects the placeless by which one is struck every other year at the center of international art. In the intoxication of the events, the contours disintegrate and discursive decisions are replaced with indifferent pluralities – somewhere between trade fair and industrial exhibition. Ravens knows that this critique is also a part of the market. The depiction of the problems of the business is a part of the business. A reason to stop drawing? Definitely not. The new works have the same devilish shine on the surface, like the joyous glance into a box of pralines. Maybe at the end, the viewer realizes he has been observing himself, in the chic scenarios of the art world that Ravens has turned into an omnipresent landscape of profit. 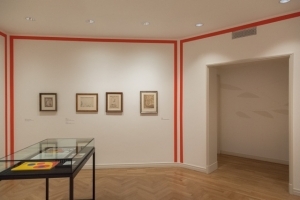 Interventional wallpainting in the Museum Berggruen by Thomas Ravens in the "SIDEWAYS. Alexander Calder - Paul Klee" retrospective exposition.